While there is no specific economic reports in Japan and Euro zone, EURJPY is massively under the influence of Brexit. 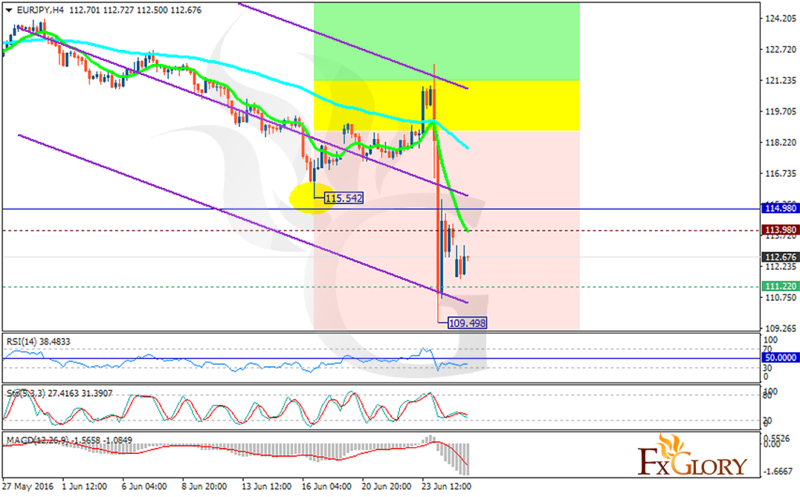 After the previous low at 109.498 the pair rose half the way but fell again and now it is fluctuating in bearish zone. The support rests at 111.220 with resistance at 113.980 which both lines are below the weekly pivot point at 114.980. The EMA of 10 fell sharply and is moving below the EMA of 75. All indicators are signaling price decline; the RSI is in oversold area, the MACD indicator is in negative territory and the Stochastic is showing downward momentum. There will be strong resistance in 113 area, short positions are recommended as far as this level is not broken.